★★★★★ This is my second purchase as a 66 year old grandma. I cut my own wood and love how this works. It is safe, lightweight, and easy to use. Something (dirt/oil) jammed the handle mechanism and the saw would no longer cut all the way through the wood. It used a lot of oil. On the new one, after a few uses, the plastic turn nob that keeps the door closed broke off. Need to replace it with the one on my first Jawsaw, but cannot get the screw to loosen. I taped it shut. It does not use as much oil as the first one. ★★☆☆☆ Saw is front end heavy for its small size, any long time usage -difficult. Forget about the optional extension pole unless u have a big red S on your chest. Working area of saw is about 4" total. Works best on 2" max limb. Slide bolt shaft is sloppy, gives it a "cheap" feel. Doesn't work as good as shown on TV. I would return except for cost &hassle. Will probably use on scrub brush. ★★★★★ This bad boy is awesome I love it. It's easy to use easy to maintain. I had a shrub/tree I need to mill and this bad boy killed it so fast. I also have been using it on roots from a huge tree in my yard. I'm so happy with my purchase. I would definitely recommend this Jawsaw. I'm not a typical guy I never used a chainsaw before I stacked logs Dad cut them. But with the Jawsaw I felt comfortable and safe. Easy to add oil easy to put the chain back on if it comes off. 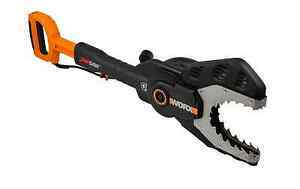 ★★★★★ Great product for cutting limbs and small trees. Much easier to use than regular chainsaws. I use a portable generator for power and can use the saw just about anywhere. This is a very safe and handy product. ★★★★★ I got this because I needed to break down branches that fall from several tall trees on my property. After a storm, I can have dozens of large branches that the city won't take unless broken down. This thing cuts through them like butter. I would not, however, want to use it on an extension pole. It is unbalanced and somewhat heavy. Using it over my head is fine, but not great.